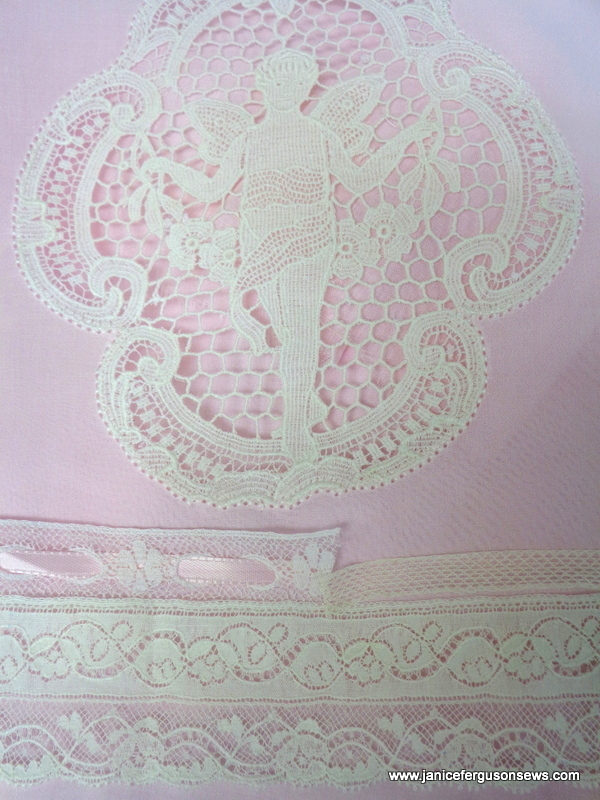 Pink Swiss voile, ivory entredeux, cherub medallion, heirloom laces and bishop pattern from Mimi’s Heirloom Sewing Book Two. My life is absolutely wonderful but SO busy! 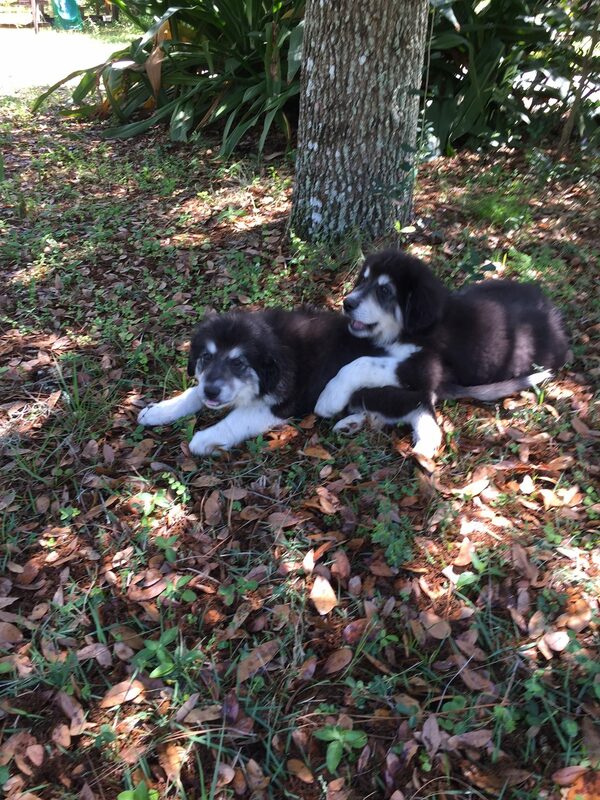 These new puppies chew up a lot of time… and a lot of everything else.! They are adorable and we are crazy about them. But they are one of the big reasons it’s been so long since I’ve posted. At this late date I am starting on Easter dresses for 4 yo granddaughter Vivian Rose. One, of course, is for Easter Sunday. The other is for the church egg hunt on Sat. But that is on the back burner until Sunday’s dress is finished. For several years I have had a piece of what must have been an exquisite tablecloth featuring cherubs and roses. You probably figured out that roses are a bonus for anything I make for Vivi. I’m thankful that someone had the foresight to save the remnants. From the first time I saw it, I imagined one of those cherub medallions in a granddaughter’s dress. Finally, the time has come. The plan is to modify a bishop with several inches removed from the front. That would leave a flat area on the Swiss voile for the single cherub. As you can see, it is already pinstitched to the voile. I love love love pinstitch and use it whenever possible. 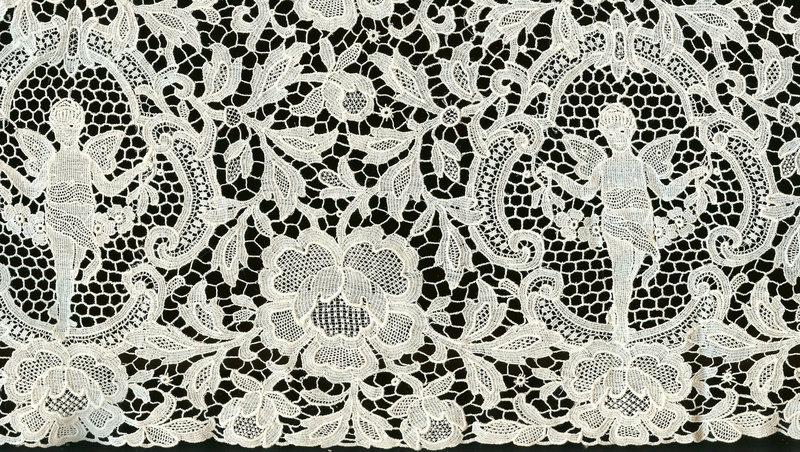 This time a #100 needle was used instead of a wing for fear that a wing would cut through the dense portions of the lace. For more about pinstitch, check out my very detailed tutorial Pinstitch~~What’s it All About and Pinstitch Part II. A This irregular shape would have been very tedious, but do-able–without the knee lift on my Brother Dream Machine. So many stitchers I speak with have this feature on their machines but do not use it. What a shame! It is so useful! 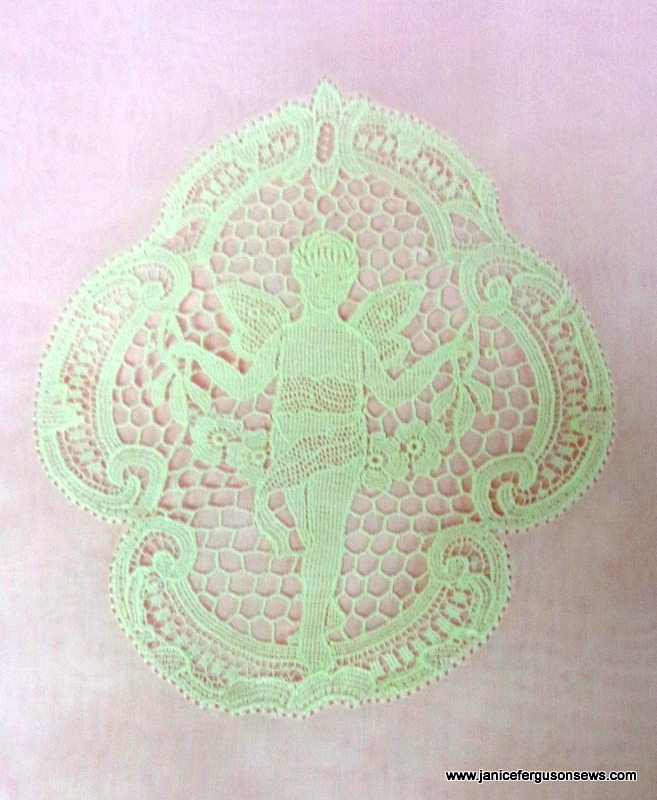 A scalloped hem is planned, with a wide curve under the cherub and roses cut from the piece in other scallops. I have envisioned this dress as “frothy” with a lace trimmed hemline. 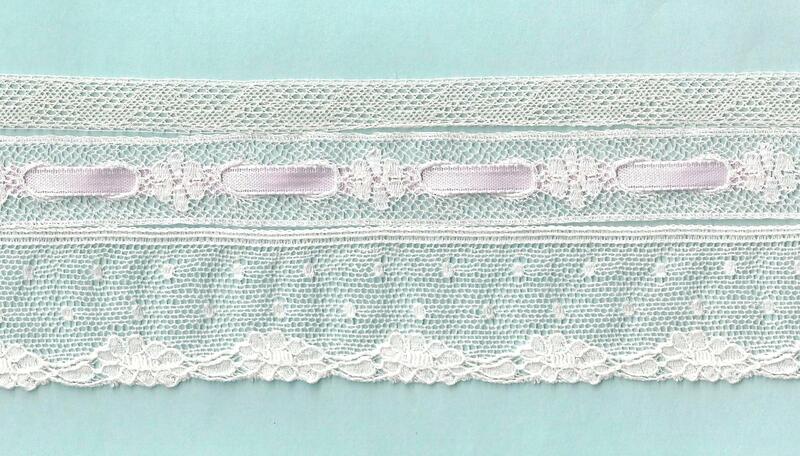 A huge challenge was finding lace that was neither white nor ecru but a very light ivory. I successfully coffee dyed a few pieces to just the right shade. But when I came across the special two row edging shown below and hoarded for years, I thought its time had come, just like the cherubs. Because 3 of anything is usually more pleasing than 2, I would like to put one more piece above it but can’t decide the use the beading or the plain footing. Of course the lace will be pinstitched in place. Which would you choose–the beading or the plain footing lace? Is the beading with ribbon too much? Is the footing too plain? Please share your opinions. Meanwhile, I’m busy constructing, pleating and smocking. No doubt many of you are finished with your Easter sewing. But I bet there will be a lot of late Saturday nights next week for some of you. And probably me. Please advise about the lace choices-the first with beading? with footing? or the second as shown! This entry was posted in antique/vintage textiles, girls, heirloom sewing and tagged antique textiles, Easter dress, Mildred Turner, Mimi's Heirloom Sewing Book II, pin stitch, pinstitch, Swiss voile. Bookmark the permalink. I love the first choice with the beading. 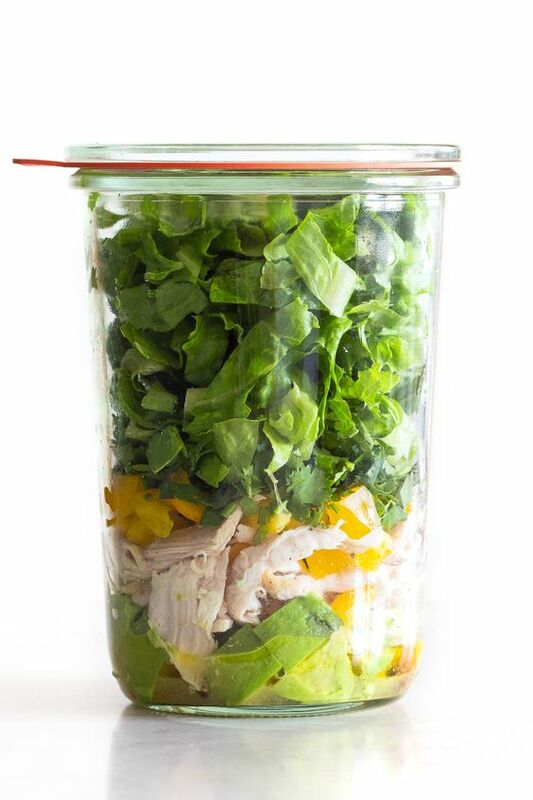 I enjoy reading your blog and am amazed you will take on this project one week out. Good luck! It will be a masterpiece. 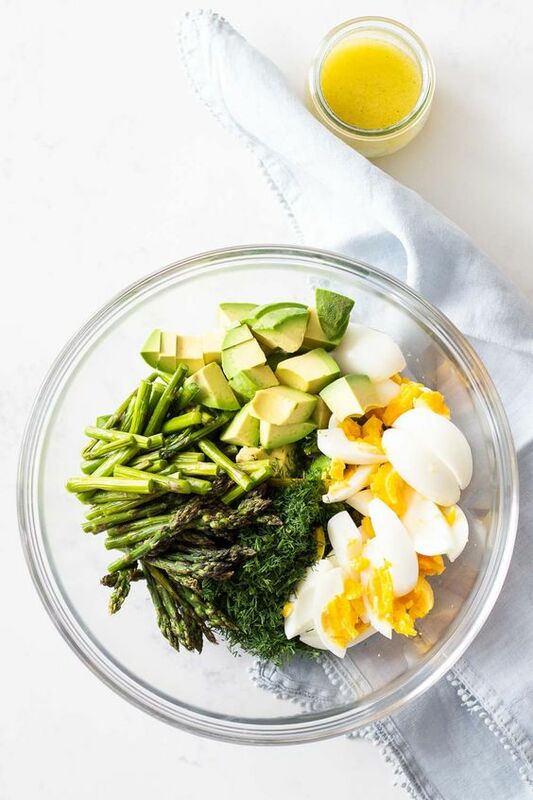 This is going to be gorgeous! I vote for the first with the beading and ribbon. I like the frothy one, too, but I think the first with the heavier lace medallion is a better match. The puppies are adorable! Kay, thanks for your vote. I hope I haven’t bitten off more than I can chew, as this sheer voile also needs a slip and bloomers. Then there is the cute bunny print for an egg hunt outfit. Whew! No optioal activities for me this week. Karen, thanks for your comment. I hadn’t considered the visual weight of the medallion. 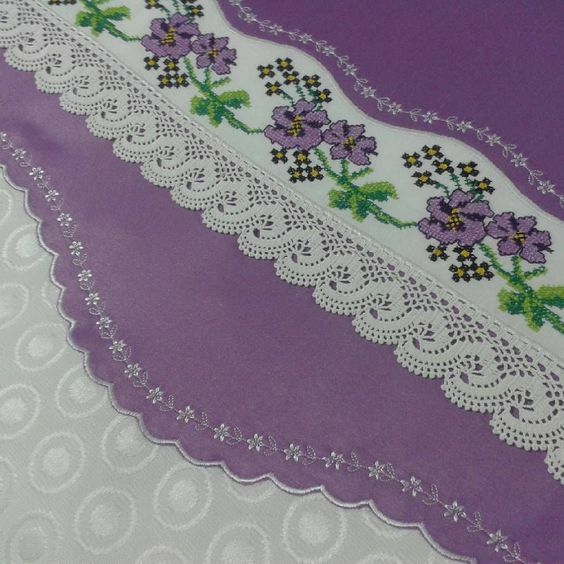 And I do love that two row lace edging…..Now if I can just spend less time with those pups I might finish it–once the lace decision has been made. I like the first one. I’m sure whichever you choose it will be beautiful and made with love. Thanks for the advice. I’m still on the fence and polling opinions. from SewForum: Sounds wonderful! Can’t wait to see it. Sorry…can’t decide about the laces…they are all so pretty. I think All laces are pretty. I LOVE lace! The challenge here was finding laces in my stash that were just the right shade of ivory to match the medallion. The next challenge is dealing with the fact that the dress may last through only one wearing by my rambunctious granddaughter. The entire family thinks that black denim is the only thing that holds up to this precious tree-climbing, dirt-rolling little daredevil. That won’t stop me. I can always make her another. from SewForum: One of my girls was a Tom Boy! I had to bribe her to get her to wear a dress…she preferred bib overalls!!!!! She looked like Alice in Wonderland with long blonde hair that I usually had in pig tails. I never learned to smock but always loved it so…remember Polly Flinders dresses? 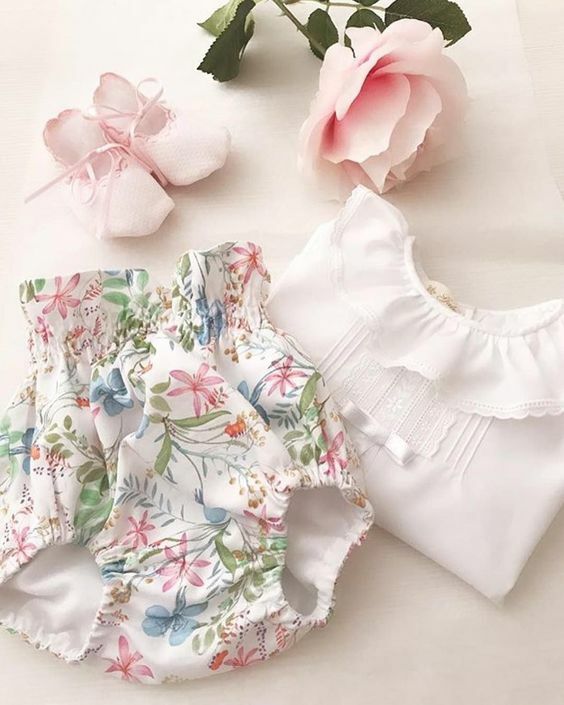 Well there was an outlet that I frequented when the girls were in school…so for a missing button or a hem that had pulled out…I got a beautiful dress for pennies on the dollar…not nearly as beautiful as your dresses…but great for school. Your daughter sounds like a blond version of our Vivian Rose. Vivi like dresses, but when I made her a pink, gray and white A-line and sent along grey leggings, she chose to pair it with her neon rainbow stripe leggings. She has very strong fashion opinions and it might take a chocolate bunny and a Cadbury egg to get her to wear this dress even once. Now if I had some leopard print leggings to go with it she might buy in. Polly Flinders was one of my main motivations to learn to smock. I was crazy for those little dresses! I wish little girls still wore dresses, preferably smocked, to school. I like the second photo much better!! It will be lovely either way!! Thanks, Jo. It looks like public opinion is on your side. That’s probably what I will go with. I’m just now ready to tackle the lace hem–I love that part. You must be cruising along ever so casually making only Joy’s dress. Does Noel get a hand-me-down beauty or a ready-to wear? This year’s Easter duds must be a relaxing effort, after coordinating all 5 children as well as a tie for Lee. You deserve a break. Thanks, Lisa, for weighing in. It looks like I’ll probably go with your choice. I really appreciate all the help and opinions that have been offered. Janice, I love the one with the blue background, it is so beautiful. I have no doubt you will finish the Easter dress and the one for egg hunt with time to spare. You are a wonderful seamstress and I’ll be waiting to see the finished dress. All your projects are beautiful!